All our 17 rooms have good beds and their own bathrooms and toilets. On the first floor we have eight rooms. One of these rooms is a suite (2 rooms with connecting door and a bathroom with toilet). On the second floor there are 4 more rooms. On the ground floor we have 4 rooms, one of which is a large suite with 5 single beds. One room is suitable for disabled guests. We have double and triple rooms. Please don’t hesitate to contact us for more information via e-mail or per telephone. In the restaurant, you will find an old jukebox and a large old bar. It reminds you of a grand café. The atmosphere is informal and makes you feel at home. Our guests sometimes play cards, backgammon or other board games, read a book or start a conversation with other guests after dinner. Whether you come from Switzerland, Germany, Belgium, the Netherlands, Great-Britain, Luxembourg, France or the other side of the world, sharing a drink is a language everyone understands. If the weather is nice, it is possible to eat on our terrace. Ietske often prepares regional specialties, like chicken in Riesling-sauce, choucroute etc. but also spareribs. We have a lot of wines from the region, like the well-known Riesling, but also Pinot Blanc, Pinot Noir, Muscat and Pinot Gris (also available as Grand-Cru). After diner you can enjoy a cup of coffee from our espresso-bar and a local brandy. We are sure you will feel at home in our hotel. 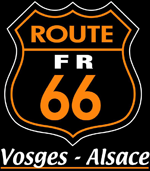 The hotel is situated in the high Vosges, which is one of the most beautiful motorcycling, cycling and walking areas of Europe. Here, you can enjoy fresh mountain-air, and a variation of mountains and forests. We have tours on GPS for motorcycles and cycles. The Club Vosgien has a lot of well-organised hiking tours, which are clearly marked. Some start just behind the hotel.